To combat the threat to US military aircraft posed by birds and other wildlife, Ellsworth Air Force Base has installed bird cannons. Four years ago, a US military helicopter crashed in the UK, killing all four crew members. The cause: a flock of geese. Birds and wildlife pose a deadly threat to American military aircraft and their crew. Between 1985 and 2016, bird strikes killed 36 American airmen, destroyed 27 US Air Force aircraft and cost the service almost a billion dollars, according to the 28th Bomb Wing Public Affairs Office at Ellsworth Air Force Base. Defensive technology has improved, reducing the number of incidents, but destructive accidents continue to occur. Between 2011 and 2017, the USAF experienced 418 wildlife-related mishaps, resulting in $US182 million in damages, according to Military Times. Canadian Geese alone cost the USAF almost $US100 million between fiscal year 1995 and fiscal year 2016. To counter the threat posed by birds, Ellsworth Air Force Base in South Dakota installed an automated bird deterrent system – special cannons designed to keep the animals away. The $US150,000 bird abatement system consists of a rotating cannon and a propane tank. The cannon produces a loud sound similar to a shotgun blast to scare the birds away. Some units, the Associated Press reports, are equipped with speakers able to blare the distress calls of several different bird species. The bird cannons only require around $US2,000 a year to maintain, which could mean significant savings for the base. US Air Combat Command/Wikimedia CommonsBird strikes are problems the world over. 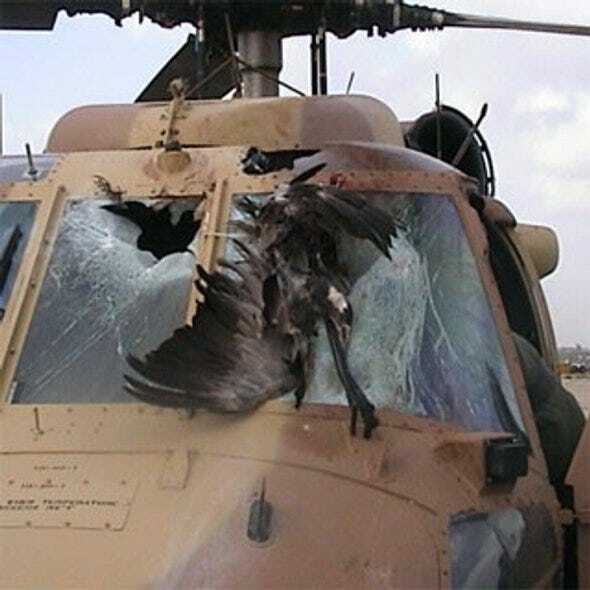 This photo shows an Israeli Air Force UH-60 Blackhawk after a bird strike. Some of the other tools, outside of manpower, that have been used to keep birds away from US aircraft in the past include the Avian Hazard Advisory System (AHAS), a weather radar that can keep track of flocks of birds, and a bird detection radar for monitoring individual birds. Not every Air Force base is equipped with these defence systems though. At Ellsworth, which is home to one of the two Air Force B-1 Lancer bomber wings, the previous approach to dealing with wildlife was to send someone out with a shotgun. Ellsworth now has 24 bird cannons installed along the runway to protect the bombers, each of which reportedly costs around $US400 million.